This blog and website promote a view I call the American Mediterranean-style of eating. It features attention to whole foods instead of single nutrients; attention to whole yummy meals instead of lists and calculations on a few nutrient categories. My blog also shares recipes and methods to manage one’s life, so as to attain the health and family/social benefits of this style of eating. The food must be delicious and enjoyable in every way – yummy for short. What is the genesis of this perspective? This blog post recounts part of that life story, with a focus on weight management. I’d have to say that my thought processes, as related to food started at a fairly young age. I wasn’t what I’d call a ‘picky’ eater as a small child; but I had a few dislikes, including not liking frosting on cake or whole milk. Go figure! The first real milestone happened shortly after my eleventh birthday. I moved back to my native California, from Kansas (my father’s native state). When I moved, which involved my parental custody changing; my maternal family thought that I was emaciated – that was quickly resolved. I was offered heavy fatty food frequently; as a result I went from being a very thin small-framed girl to being overweight. I wasn’t too fond of being overweight, so after a few years of that, I started working to maintain a normal weight. Unfortunately, during the ‘gaining weight phase’ I learned very well how to overeat. Boo Double Hoo. I have spent considerable effort during my entire life in maintaining a healthy weight; which I mostly did, except during my third and last pregnancy. It took me six months to take off most of the 65 pounds that I had gained during pregnancy. Yes, the baby did weigh something; a full 8 lbs. 6 oz. I start with this weight issue, because I believe that struggling with overweight, at any level is challenging. I have struggled personally with weight management long enough and have counseled those with obesity for enough years, to appreciate the challenge and complexity of the struggle. When a student studies nutrition, they learn about the beginning of nutritional science. When scurvy, beriberi, and pellagra were discovered. These diseases appeared in the population after the time when refined foods were introduced to the masses. The prime example is the introduction of refined flour and white bread. The refining process took out the coarse bran and the oils and other nutrients in the germ that could spoil. Many nutrients were lost in this process. The story continued with the people being magically healed when they were given the single vitamin whose absence brought on each of these diseases. The student was taught that an individual needs a certain amount of specific nutrients to stay healthy. And we students believed, at that time, that a small, knowable number of specific nutrients were all that was lost in the refining process. In the beginning, it sounded fairly straightforward, fairly simple. But then, of course, like most things in real life, you later learn about the hidden complexities. For example, how an individual’s metabolism can alter the need for specific nutrients. Then, discovery after discovery showed how large was the list of important nutrients removed by processing – all those little things like antioxidants and phytonutrients (plant nutrients) were involved too. To top it off, as it turns out, it appears that the thousands of phytonutrients are likely interact with each other, to accomplish certain functions. These finding spelled THE END of the simple recipe for carbohydrates, protein, fat, vitamins and minerals. It also spelled the real beginning of a different type of advice. The advice is to eat real foods, especially foods that grow from the earth and in the earth; and take on a jillion different colors, textures, styles; sweet and not so sweet. It spells a true appreciation of the bounty of earth. Nature provides an incredible bounty – it’s not just corn fed to beef, served with rubber cheese, on a white flour bun (of course, with about 11 vitamins and minerals added to “enrich” the impoverished flour.) That type of food (using the word loosely here) doesn’t provide the thousands of nutrients available in whole grains and other foods derived from plants. One of the pivotal ‘Ah-ha’ moments of my formal education was during the time I was studying for comps (Ginormous tests) for my Master degree. I was studying about what stimulated glycogenisis (how the body to stores glucose, really glycogen) and what stimulated glycolosis (Kreb’s Cycle) changing glucose to energy. I noticed that two different actions could be happening at the same time and it didn’t make sense what the body would do. I was certain that I would be asked this in the exams. I was so confused that I went to speak to Seymour R. Levin an incredible M.D. who was a Professor of Medicine at UCLA and a researcher at the VA where I did my internship. The answer did not take him much time, but it made a huge impact on the decades of my career and my thinking about nutrition. What he essentially explained is that many of the processes that go on in our liver (and elsewhere in the body) go in both directions at the same time. In short, what he got through to me is that these systems are not completely shut down in one direction, but that it is the net balance of the two systems that creates an over-arching direction. I was confused because I understood that when the body needed energy for example – stimulating glycolosis, that glycogenisis (storing energy) would be 100% shut off. The point of telling this here is that it opened a door of understanding that I had not received during the first 6 years of college. The human body is not black or white and its systems are not necessarily completely off or on. One’s body is not a simple machine; even the individual cells are intelligent enough (in their membrane) to sense and know how to adapt quickly to changing circumstances. Another realization that is important to my nutrition perspective is that nutrition is an infant as related to science. I realize that many people like to have black and white answers to complex questions. Frankly, I’m one of them; but I’m beyond Santa and the intrigue of this type of fantasy. Food is varied, cooking methods are varied; and the methods of learning how many nutrients an individual is actually eating in a certain diet (except TPN – total parenteral nutrition – simple nutrients put directly into the bloodstream) are exceedingly limited. I feel compelled to debunk the Santa story for those who are looking for some Fountain of Youth ingredient, that gives a ‘home free’ pass to eat whatever you want and take a magic berry or fortified drink and that’s all the body will need to be healthy. Note: If the ‘magic berry’ is incredibly expensive, it seems to make the victim who purchases it all the more hopeful that it will be the ‘magic answer’ to all nutrition needs. What I know is that nutritional science discovers new nutrients, antioxidants and phytonutrients (plant nutrients) constantly. What is being learned is making nutritional science more complex than any of us ever dreamed. As a result, this growing body of evidence pushed me farther and farther toward the Mediterranean-style of eating. I’ve lost trust in the simple formulas like “eat one serving of this and 5 servings of that”. I actually believe that Michael Pollan has a lot of it correctly figured out. If you’re eating lots of plants (fruits, vegetables and whole grains) then you’re likely getting some of the most important nutrients. Very shortly after I finished my formal education, I stopped telling people that they should get so many milligrams or micrograms of this nutrient or that nutrient. Why? Because I felt that very few people had any way of knowing how to consume that specific amount. I decided that I could do better by encouraging the whole, understandable foods that generally contain those nutrients. My idea, based upon decades of experience, is that telling people the strive to get ‘X’ numbers of milligrams or micrograms of a nutrient; or to get ‘X’ percent of saturated fat or ‘X’ ratio of protein/carbohydrates/fat in their diet is … well, it’s most usually useless. I’ll try to share briefly why I say this. Unless someone who has powerful software and the time (or in my past situation, a staff of whom a large percentage were technicians, who calculated all the nutrients for hospitalized patients), people just don’t know what their percentages, are, neither their milligrams, nor their calories. Now having said that, I want to hedge that statement – having a general concept of your calorie needs and intakes can be useful – at least during initial evaluations of where your stand. Knowing your approximate BMI and exercise can help motivate you to switch from burgers to more vegetables and less meat. If you have calculated your BMI and know that you should eat about ‘X’ calories and are striving to exercise a certain amount of time each day, you will think twice about considering a burger served at Burger King. If I know, for example, that I can eat about 1700 to 1800 calories per day to maintain my weight as long as I keep exercising; and I notice that the Double Whopper with Cheese is 1010 calories; a medium French Fries 400 and a Medium Strawberry shake is 550 – I know – Yikes! I’m in big trouble. That would be somewhere between 160 to 260 calories more than I need in an entire day to maintain my present weight. My problem is that I have this quirky habit of eating breakfast, lunch, dinner, and a snack or two each day. If one meal is a couple hundred calories more than I need for an entire day, where will this lead? I think this is what is happening across America. People just don’t know. They don’t realize how calorie dense the processed fast foods are. I don’t think that you need to calculate all day long, but if you do calculations a few times and learn the principles, this may lead you to a certain ability to do quick assessments. This may instill in you greater wisdom. Since short term evaluations and self-studies can be important, I hope to introduce tools and methods in the future that will help with these short-term self-evaluations. Dr. Grandpa is an expert in measurement tools and instruments, and will investigate and try them out before we make recommendations. 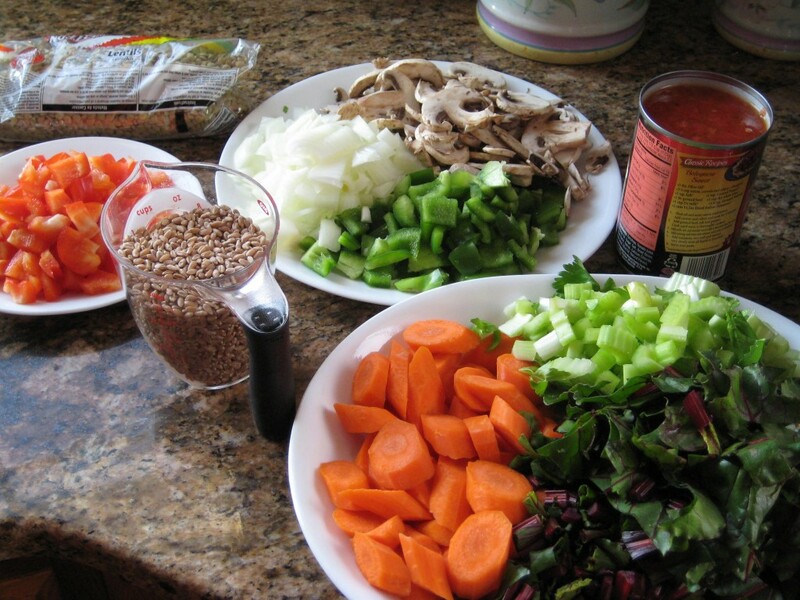 If you need to lose weight, I think that you may be pleasantly surprised if you start eating fairly large servings of vegetables, replacing some of the starchy foods and lots of the meat and cheese. I feel much more comfortable in saying something like this: If you need to lose weight, strive to increase your intake of vegetables, especially the non-starchy ones, decrease your intake of processed grains and replace them with whole grains; include beans and nuts and consider having some meals with no meat; increase your intake of fish, especially if you’re not eating any, decrease your intake of processed meats and red meats. The point is that you can start where you are, and improve your diet. If you eat fewer processed and junk foods, and start eating a Mediterranean-style diet, you will almost automatically increase the ratio of nutrients you eat and decrease the salt, fat, sugar, and empty calories. So this is the Mediterranean-style of eating I advocate. It is not a diet. Cutting calories too much can cause your marvelously adaptive body to think starvation is occurring. It adapts by reducing leptin, the hunger-suppression hormone, so you will feel the compulsion to eat more. It finds ways to get you to eat, and things can really get out of balance, promoting overeating rather than satisfied restraint. It does not require detailed calculations or pseudo-scientific mumbo jumbo about nutrients you cannot pronounce, and whose role in health cannot be separated from all the other nutrients in a whole food. So eat the whole food and let your smart body cells figure out from the thousands of nutrients you offer it which ones it needs. Concentrate on making the bounty of the foods that nature provides, look, smell, and taste great without all that salt, fat, sugar, and empty calories that refined foods and most restaurant foods contain. Enjoy the society of family and friends in the process – break away from every person to himself with bag of snack or fast food. If you’re used to having meat in your lentil soup and you’re trying to have a meatless day each week, you may want to consider trying wheat berries – seriously you won’t miss the meat. 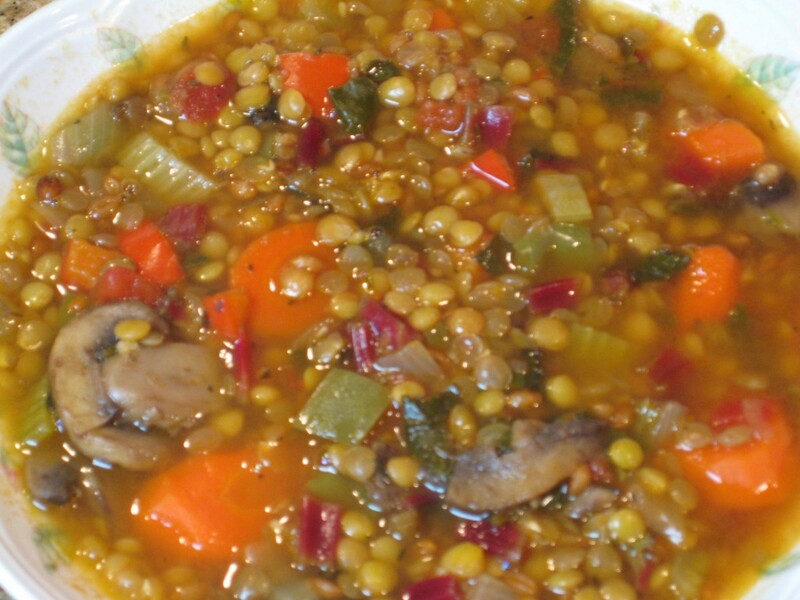 The wheat berries give the soup and nice texture. This soup celebrates the bounty of nature. 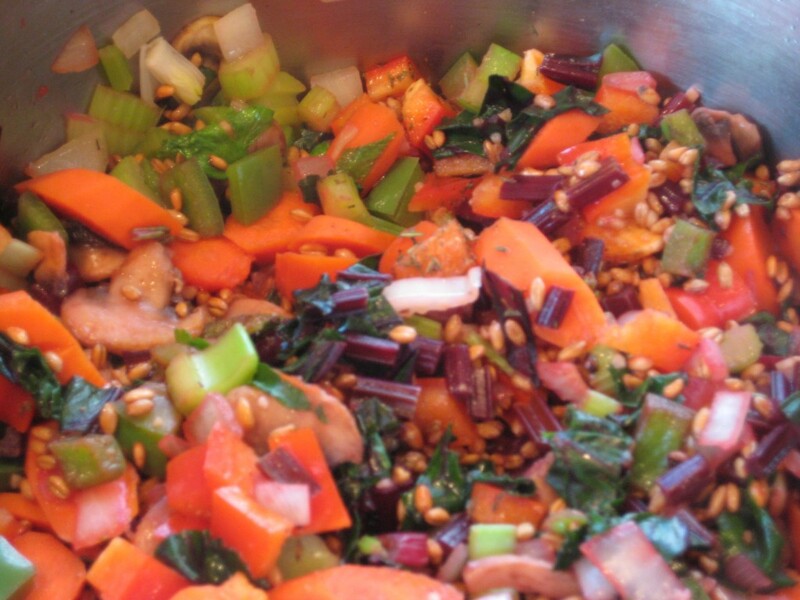 Sauté wheat berries in oil to give a nutty flavor, about 4 or 5 minutes. 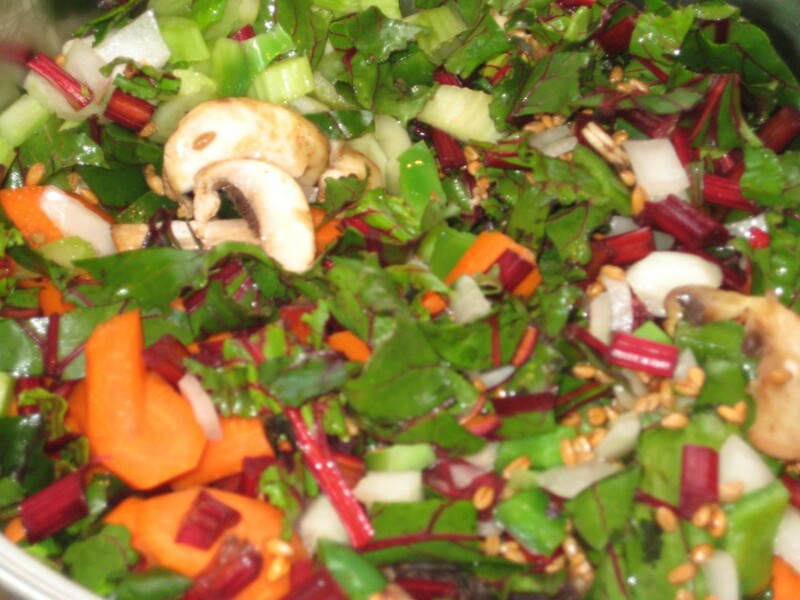 Add the onion, chopped beet tops, mushrooms, pepper, carrots, and celery, keep sautéing until onions are somewhat clear, about 6 minutes. Add the garlic, red pepper, black pepper, thyme leaves, cumin and sauté for a minute or two. 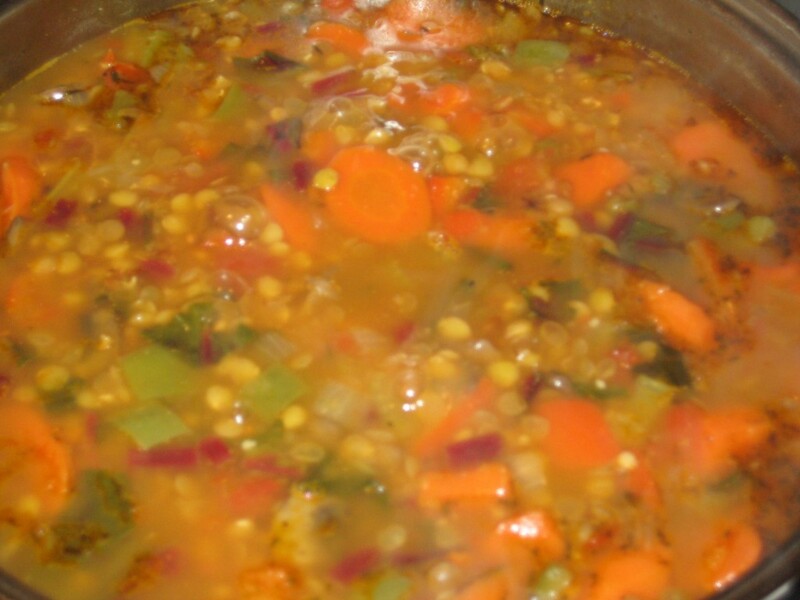 Add the tomatoes, lentils, and broth, stir all ingredients and bring to a boil over a high heat. 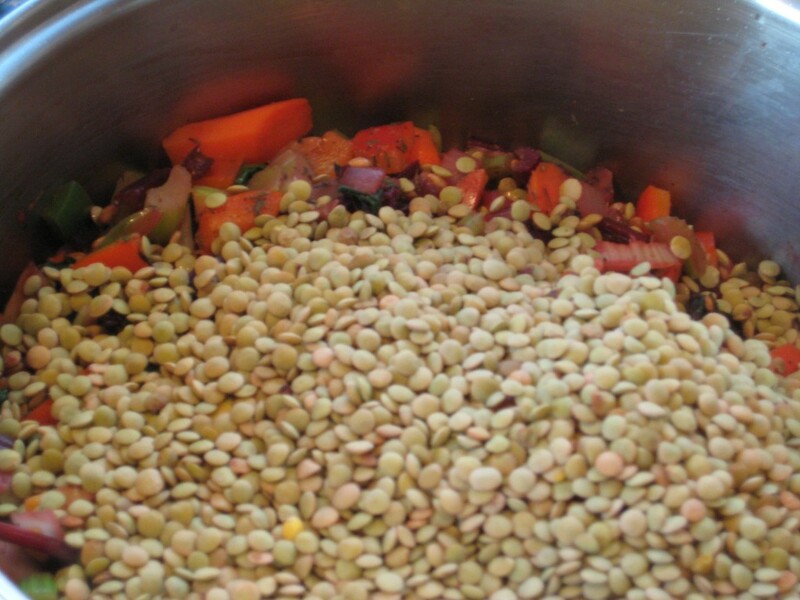 Reduce heat, cover and simmer until the lentils and wheat berries are tender, about an hour. 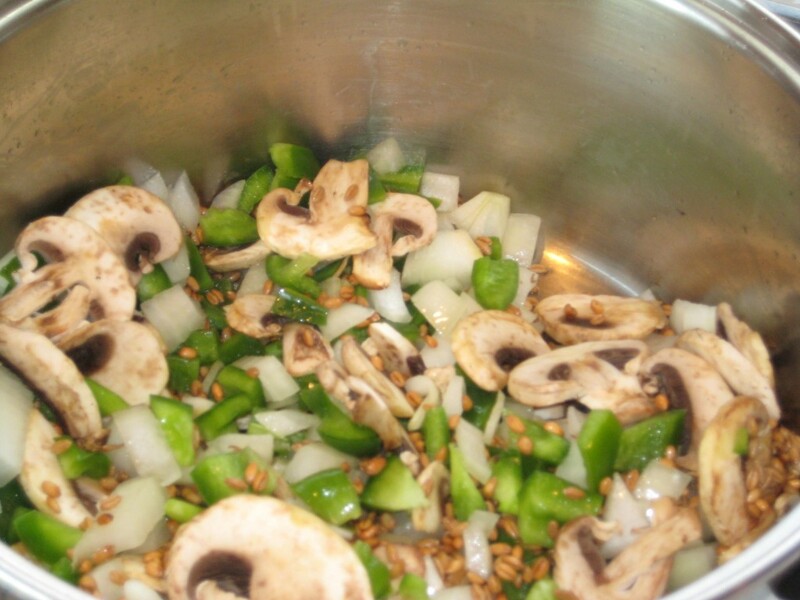 Add onions, peppers and mushrooms to toasted wheat berries. Saute the vegetables in olive oil. Serve your delicious bountiful meal. I agree totally with your philosophy. The hardest part is getting clients to believe that nutrition can be this simple. In my group presentations I emphasize how easy and efficient ‘homemade” can be. That seems to be a major issue, especially for families. Perhaps there should be a public health campaign that pushes the health, ease and economy of making it yourself. I was doing a little research a few days ago to find something that would recognize the work that dietitians do. During that time, I found a few quotes that said things about making a difference, one person at a time. I didn’t use the concept in the piece that that I will post tomorrow for National Dietitian’s Day, but it did make me feel better and maybe it can help you too. It’s a bit frustrating bumping up against big food chains, food manufacturing and the mores of society; but let’s keep working on it, ONE person at a time. I truly believe that we are chipping away right now. I so appreciate the work you are doing in your groups, even if you only make a big impact on a single individual. I think your desires, our desires, may turn to be a zeitgeist eventually – it will just happen. I worry somewhat when I put up recipes that people will be overwhelmed; I know that they can just cook some frozen broccoli, a piece of chicken and microwave a potato. My goal, however effective is to help people discover that homemade food can taste better than gourmet restaurant food, while being better for them/us. It’s true that it would be nice is there were a public health campaign like you describe, but they’d have to first get past the lobbyist who don’t want that to happen. So you and I (and probably lots of others) will keep chipping away, and if it happens – the public health campaign, that is, that will be great; but let’s not wait.